3 + seven = Required Please enter the correct value. The Facebook stock price is trading at all-time highs this morning (Thursday) after the tech giant crushed Wall Street's expectations in its Q1 2016 earnings report. 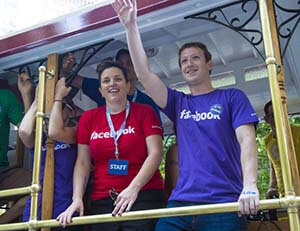 The Facebook share price is already up 10% today (Thursday), opening at $119.57 per share. But now that the FB stock price is trading at all-time highs, investors are asking if this is the best time to buy Facebook stock. Facebook reported earnings per share (EPS) of $0.77 on $5.38 billion in revenue. Analysts expected the social media giant to report $0.62 on $5.26 billion. Revenue for Q1 was up 48% from the same time a year ago. Even with a large user base, Facebook still saw solid growth in monthly active users (MAUs) for the quarter. Facebook went from 1.59 billion MAUs last quarter to 1.65 billion in Q1. That's a 3.7% increase. For comparison, Twitter was only able to increase MAUs by 1.6% this quarter. Facebook also grew its daily active user base. Facebook reported 1.09 billion daily active users for Q1, which was a 4.8% increase from the 1.04 billion reported in Q4 2015. Zuckerberg stated that through Facebook, Instagram, and its communication service Messenger, people around the world spend more than 50 minutes per day on Facebook's platforms. It's true that the Facebook stock price may look expensive today, but Money Morning believes it has even more room to climb in 2016. You see, Facebook has two massive revenue sources it's slowly monetizing: Instagram and Oculus Rift. Zuckerberg has never shared how much ad revenue Instagram brings in, but analysts believe it generated between $650 million to $750 million in ad revenue in 2015. Plus, mobile advertising revenue climbed to 82% of Facebook's total revenue from the 73% reported in Q1 2015. That's a 9% increase in a year. COO Sheryl Sandberg stated that more than 3 million businesses use Facebook's advertising products, and there are more than 200,000 businesses using Instagram. Instagram has a massive user base with over 400 million MAUs, which is 90 million more than Twitter's 310 million. By 2017, research site eMarketer projects the mobile picture app will account for as much as 10% of Facebook's global ad revenue. Zuckerberg purchased Oculus VR in 2014 for $2 billion. While virtual reality is mainly associated with video games right now, it's the future capabilities of the software that will make Zuckerberg billions of dollars. You see, Zuckerberg stated after buying Oculus VR that he had grander ambitions than games. He wants to connect teachers and students across the world, let basketball fans enjoy courtside seats, and create face-to-face meetings with patients and doctors all from the comfort of your home. Data research company Digi-Capital expects the virtual reality market can generate $150 billion in revenue by 2020. And outside of Instagram and Oculus, Facebook will also monetize its communication platforms WhatsApp and Messenger. Sterne Agee analysts project WhatsApp will bring in as much as $1 billion in revenue by 2017. For the Facebook stock price, analysts at Thomson First Call placed a one-year price target of $135.30. From today's opening price of $119.57, that could be a potential profit of 13%. Money Morning Director of Technology & Venture Capital Michael A. Robinson believes the FB share price will trade at $250 by 2020. If you invest now, that could be a potential gain of 109%. The Bottom Line: The Facebook stock price is skyrocketing after the company crushed expectations in its Q1 2016 earnings report. Over the last 12 months, the FB stock price is up 48%. With massive revenue sources like Instagram, Oculus Rift, WhatsApp, and Messenger, Money Morning believes the Facebook stock price will trade for $250 per share in just four years.